Many people don’t detail their engines simply because they don’t understand the process of how to do it, and they're afraid of damaging something. The truth is that your engine is a lot more resilient than you give it credit for. You can wash and detail your engine without much fear of ruining anything. You just have to remember that you are detailing and not putting out a fire. Don’t soak the engine with degreaser or use the hose at high pressure. Engine detailing takes a little finesse to do a good job. First you should remember that you never detail a hot engine. The best time to detail your engine is in the morning when it has been sitting all night. If you throw cold water on a hot engine then you run a much higher risk of causing damage. You definitely want to make sure the engine is cool before you start work. Some detailers recommend warming the engine to loosen build-up but it should only be slightly warm. If its too warm, the degreaser will dry and spot engine surface. Before you begin detailing, cover the alternator, any exposed filters, and the engine's air intake. Those are the areas that you really don’t want water or degreaser pooling in. Cover your exposed air filter with a bag, then be sure to remove the bag before you start your engine. You might also want to consider any other areas of the engine that might not be water friendly. If you have done any custom work then you may have electrical connections or gauges that you want to cover. Just think about what you wouldn’t necessarily want to get too wet. You can always hand clean those areas after you get the rest of the dirt out. Remember: Use only as much water and cleaners as needed to get the job done. Start by degreasing the perimeter of the engine bay. 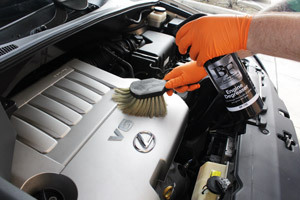 BLACKFIRE Engine Degreaser is an intense degreaser that works wonders on greasy engine bays. The painted surfaces are fine to use degreaser on, but it will remove wax. Make sure you get the fluid containers and hoses degreased as well. Those are areas that usually get extra dirty. Spray down the firewall at the back of the engine bay and be sure to get as far down as you can. Degreaser won’t do the whole job for you, but it will certainly make things easier. To get the degreaser off you simply need to rinse it with a slow stream of water. You can use your thumb over the end of the hose to create a little pressure, but for the most part the degreaser will do the work and get the dirt off. Anything that doesn’t come off can just be wiped down. Again, a clean engine doesn't come in a bottle or a can. You usually have to wipe it down by hand in order to get the engine really looking good. After you have rinsed what you can, the rest needs to be done by hand. It is best if you have a wash mitt that is specially designated for engine detailing. You don’t want to use the same one for the engine that you would use for the rest of the car in order to prevent cross-contamination. For crevices and any areas that you can’t reach by hand, the EZ-Detail Brush will come in handy. This flexible brush is covered in soft, nylon nylex bristles that are chemical resistant. The brush is 18 inches long overall and the bristles will flatten against the center rod to squeeze into tight places. Wash the perimeter of the engine and make sure that all the dirt is gone. 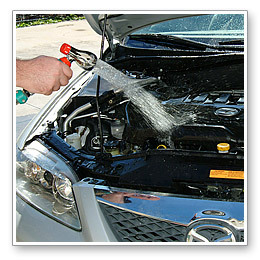 You can also begin washing toward the middle of the engine where you may not have sprayed any degreaser. Some of the fluid containers and caps may need a little extra elbow grease, so make sure you get those areas as well. Some areas may require you to use detailing brushes to get the grime off. Always use soft bristled brushes and never use brass or stainless steel ones. Those will scratch plastic and paint and really take away from the look of your engine. You may need to mix some soapy water in a spray bottle to assist in your detailing. That helps get the areas that need to be hand detailed. You can also use a good quick cleaning product, like BLACKFIRE Waterless Wash. Just have plenty of shop towels handy to wipe down the areas when you are finished. 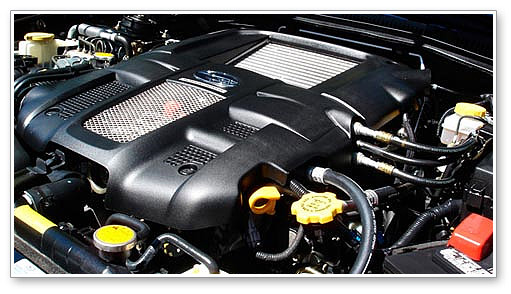 You may also want to designate a few microfiber towels for engine detailing. The 6 Pack of the Cobra Mango Breeze Microfiber Towels is a great value, or you can upgrade your buffing towels to Cobra Super Plush Deluxe 600 Microfiber Towels and use your old towels for engine duty. 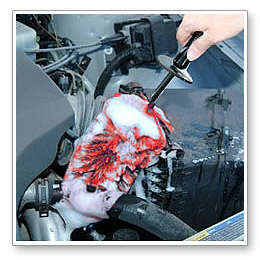 The engine needs to be dried before proceeding with wax or protectants. Use a Metro Vac N' Blo if you have one at your disposal. This blower will get water out of places you can't reach with a towel. If you don't have a Vac N' Blo, use a can of compressed air to blow water out of crevices. Stoner E-Z Gust will work just fine. After you have cleaned all the dirt off, it is time to shine it up. You can actually wax the paint if you want to, but you may want to use a high quality sealant instead. The engine bay gets way too hot for a carnauba-based wax to last very long. Wolfgang Deep Gloss Paint Sealant 3.0 is a great product to use on the painted surfaces under the hood. Collinite Insulator Wax #845 is literally made for hot areas so you’ll have no problem with durability from this product. To shine up the plastics and hoses you can use a quality rubber/vinyl protectant. Wipe down the hoses and all plastic surfaces to make sure they are protected against heat and stains from grease or dirt. 303 Aerospace Protectant will provide outstanding protection with a subtle matte finish. If you plan on showing off your engine compartment, use something with a little sheen like Pinnacle Vinyl Rubber Protectant. Your engine will look so much better if you take a few minutes and clean it up. A 10 year old vehicle doesn’t have to have an engine that looks 10 years old. Once you get the engine clean once, maintaining it with regular wipe-downs is much easier. The tools and products listed here will help you keep your engine bay looking as polished as the rest of your vehicle.